The Gunpowder has dropped from late April high flows and leveled out from 600 CFs down to 140 CFs. Flow from Prettyboy Dam is still a combination of spillover and bottom release, so water temps are fluctuating from the high fifties to low sixties. 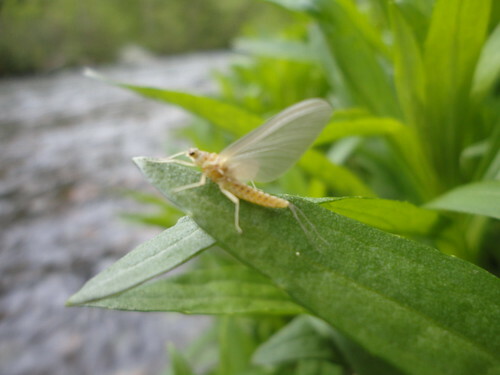 The warmer water has spurred on hatches of numerous mayflies and caddis. The caddis hatch is best in the morning to midday, and again just before dark. 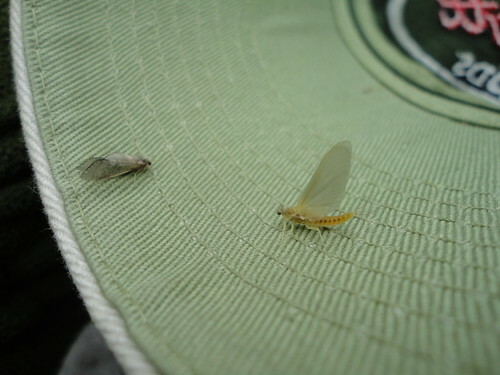 The trout will take dries, but swinging or nymphing pupa patterns has been extremely effective. Sulphurs are now hatching steady each afternoon and I hit three spinnerfalls this week. The emergence of the size 14 duns in the afternoon brings splashy rises, so anglers can find trout feeding on top. The most effective way to catch fish is to swing nymph tandem rigs through the riffles. A number of first time anglers on four hour guide trips landed between six to ten trout, which was usually a third or quarter of the total number of strikes/hook ups. Slowly lifting the rod at the end of the swing will produce strikes, so leaving the flies hang for a few seconds is a good idea. Nymphing is also a sure way to catch fish during the sulphur emergence, and will likely lead to fish slightly larger than those taking dries. I spent a few hours midweek nymphing on the Gunpowder when I ran into Jeff Lewatowski (BWA guide). Jeff was having a lot of success on streamers, so it seems the fish are taking all types of flies. We moved to a section of riffles and I caught browns and one brookie swinging nymphs. Jeff stayed close to shore and waited out the trout, slowly picking off the risers taking duns. We both fished an area roughly 100 feet long, but it produced ten fish for each of us over an hour. We saw sulphurs, caddis and hendrickson spinners flitting above the water at dark. We started hearing the sound of fish splashing loudly as they ate spinners. The window of aggressively rising trout may be brief, but well worth it for anglers who wait out the last forty five minutes of daylight. I fished another evening in a different section and saw a much heavier hatch of sulphurs emerging. The browns were leaping out the water for the duns, but in the higher water I was catching trout on pheasant tails. At dark I watched as egg layers returned to the water, as smaller sulphurs emerged simultaneously. I switched to a small sulphur dun, and fished through a few riffles of rising trout. It was good to see so many bugs, catch trout on dries, and to return to an empty parking lot. Many anglers tend to gravitate to the upper sections, but there can be great fishing and few anglers at other access points. The photo below pretty much sums up that the the best dry fly action is at dark. The latest video post features some really high water a few weeks back, sulphurs and caddis, and a few pretty browns I caught. This entry was posted in fishing report, video on May 7, 2011 by Jason du Pont.